Qurratulain Hyder was 80 years, 7 months	& 1 day old age. Qurratulain Hyder was born on 20th January 1927 in Aligarh, British India. She is a famous Indian Writer, Journalist, Novelist, Academician, Translator, Literature, Author, Critic & Playwrights. 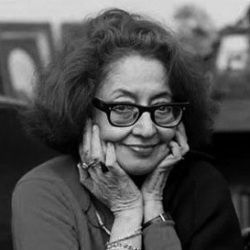 Her best work was Aag ka Darya published in the year 1959. Both of Hyder’s parents were writers and therefore named her after a famous Iranian poet Qurrat-ul-Ain Tahira. Qurratul Ain, literally meaning 'solace of the eyes' and is often used as a term of fondness. She qualified from the University of Lucknow with a master’s degree in English literature. In 1947, after the partition, Hyder and her mother went to Pakistan. In Pakistan, she maneuvers on documentary films. She then moved to England, where she was employed with BBC. In 1961 she came back to India and settled in India. Along with writing, she was employed as a radio and magazine journalist and was invited at several universities in India and the U.S to teach Urdu. Her famous works include Aag ka Darya, Mere Bhi sanamkhane, The Street Singers of Lucknow and Patjhar ki awaaz to name a few. On 21 August 2007 after a prolonged lung illness, she succumbed to death in a Hospital in Noida.